Frozen Dog Food is highly nutritious and a natural way to feed your dog, that is produced using only raw ingredients. As raw ingredients are used to produce the frozen dog food, none of the essential nutrients are taken away. 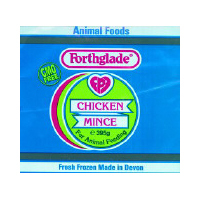 Frozen Dog Food is Free from added Artificial Chemicals, Preservatives & Flavourings. The raw meat is minced for convenience and then quickly frozen and is available in a variety of flavours, such as Tripe, Lamb or Beef. Feeding frozen meat which you thaw and serve, is a tried and tested traditional way to feed your dog a diet that offers a fresh, nutritious & convenient alternative to artificially processed pet foods. Once defrosted the frozen mince easily coats and covers a mixer or complete biscuit with a appetizing fresh minced meat coating. Frozen Dog Food: 5 stars out of 5 based on 0 user reviews.